I was supposed to blog about this yesterday, but I was suffering from this relentless migraine again. And my little major awardee was down with cough and colds. So I decided to sleep it all off. 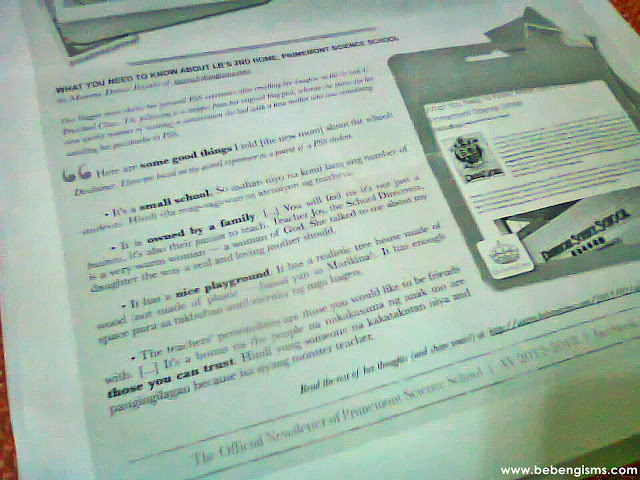 Now, it's a Monday and I got domestic duties still, but my body was asking for some blogging aura first. Upon checking my drafts folder, kaloka, ang dami kong pending posts! This is not good. I never had like more than five unfinished articles! Jeez. Anyway, let's start the kwento. This is going to be a bit lengthy and flooded with photos. Please be patient. Last Saturday, LB finished her first year ever of schooling. I did not cry as I expected myself to do, pero I was a little senti. Nakakaloka, nagka-award siya, mothers! Most Improved student in Behavioural aspect sa class nila. According to the teachers, MAJOR AWARD ito. So major major din ang happiness ko. Sa mga nakakakilala sa anak ko how likot she still is, wala akong pakielam sa opinyon niyo, actually. Haha! Pwede naman kasing from worst to worse, di ba? 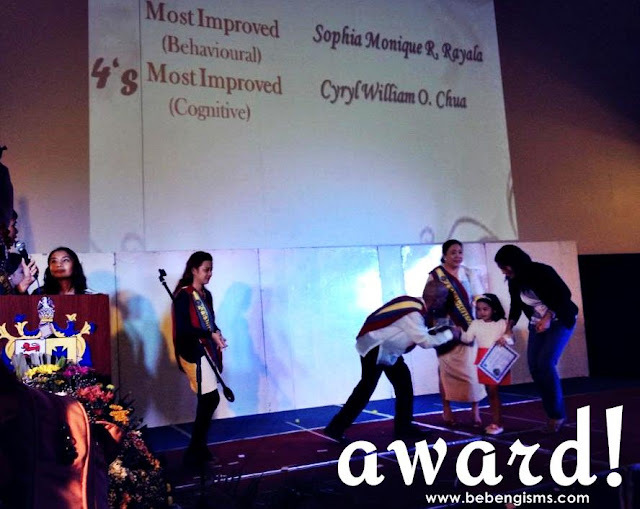 Hindi naman sinabi na Most Behaved ang award eh. Rhambo was not expecting any recognition nga daw for LB. Ako, to be honest, nag-expect ako ng konti. Bragging aside, awarded student ako lalo na nung ka-age ko ang bagets. It was me and my sister N who always used to take home gold medals and certificates for our parents. Kaya may konting paghahanap factor ako. I knooooow, bad yun. Pero hindi ko naman siya sinusubsob sa pag-aaral, ako pa! Chill lang kaya ako. Ayan, sa sobrang pagka-chill, wit niya pa knows magwrite ng name. 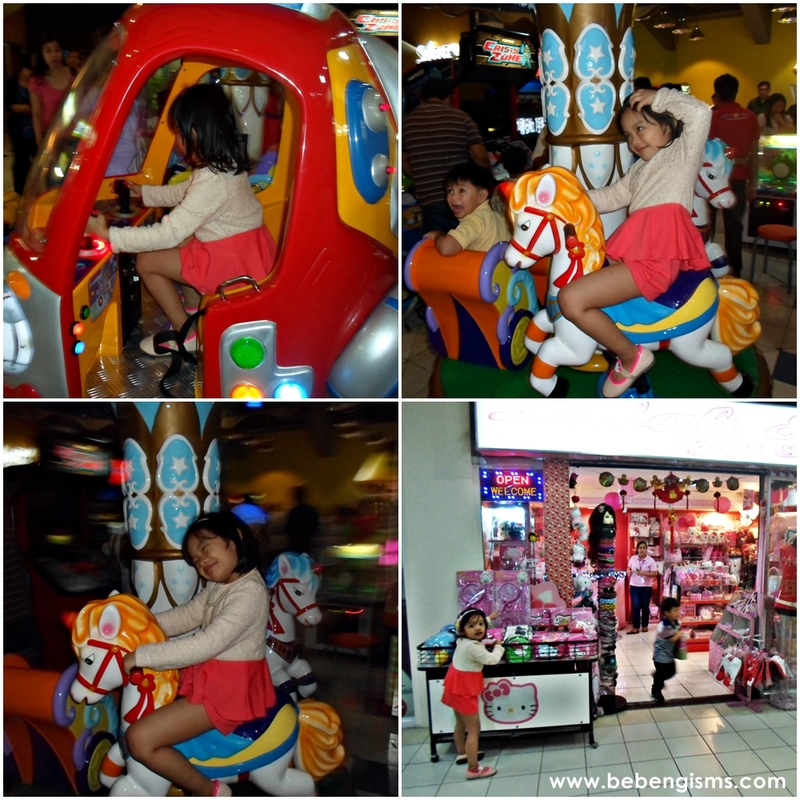 Sabagay, 4 years old pa lang naman. I'm sure matututo din siya. Aba eh kung nireregla na tapos hindi pa nagsusulat, talagang magwo-worry na ako. I wanted to just let the photos speak for what happened during the Moving-Up but I can't let this pass without saying na I was so disappointed with how the seats were arranged. 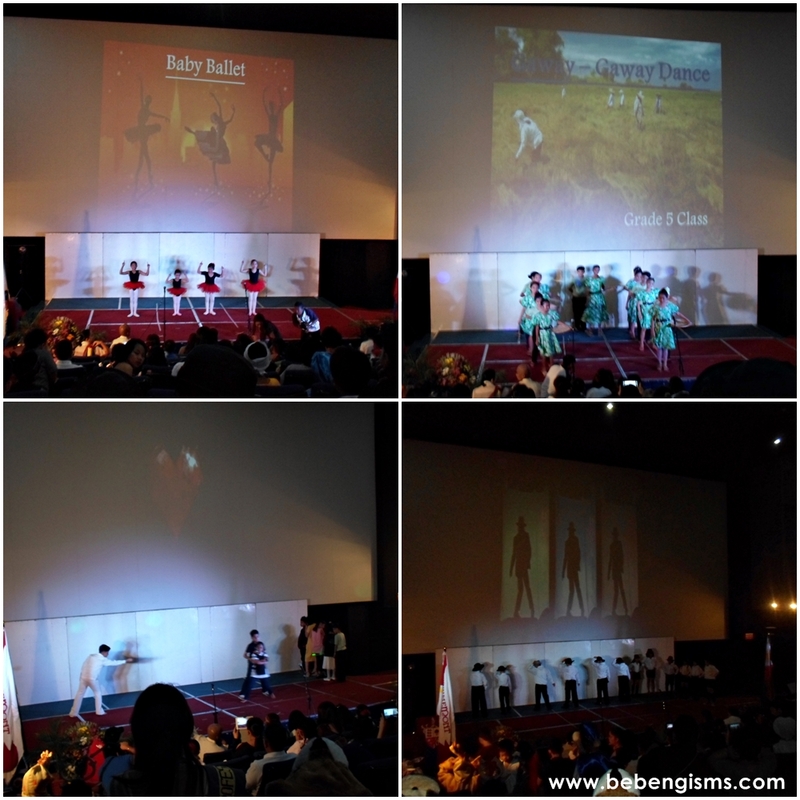 It was held in Blue Wave Perfect Stage Cinema 4 in Marquinton, Marikina City. It is an average cinema house. Fully airconditioned nga that most attendees frequented the comfort rooms eh. I commend the school for choosing the place as it is nearer to the families of their students; compared to Bureau of Soil auditorium, which was last year's venue. But what I did not like was they sold us tickets, without limiting the number of people who could attend per student. So what happened was, jampacked the place and hindi nasunod yung seating arrangement. Gusto ko ng mang-away ng isang parent na umupo sa seats namin, kaso nung makita kong stressed na din ang kawal, tumigil na ako. 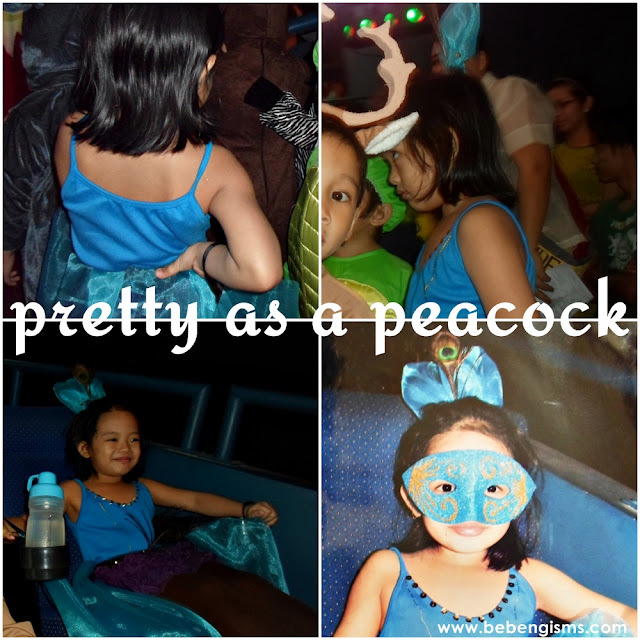 Ayokong bigyan ng umeeksanedorang Nanay ang little peacock. Ending? Sa floor naupo si Rhambo. Ang saya! Dinadaan-daanan lang ang jowa kong minsan na nga lang mag-polo. Hahaha! He even commented, "magdo-donate na sana ako ng podium na may emblem ng Primemont kaso sumakit likod ko eh, wag na lang..." Ang taray! Tunog politician ang atake. It also ticked me off a bit when other parents treated the event as if they were watching a movie. Kasi nga nasa loob ng sinehan. Aba, bumili ng snacks and refreshments! At cool na cool pang lumakad-lakad sa aisle. Kalerks. At eto pa, I thought Sunday Best muna ang outfit nila, pero pagdating eh naka-costume na lahat. Nawindang ang mascara ko, humulas sa pagmamadali na bihisan ang peacock. Jabar kung jabar. Pwedeng igiban yung kili-kili ko sa pawis. Nung nakahinga-hinga na ako, I leafed through the annual newsletter they gave us and saw an excerpt of what I wrote about the school here. Ayun, napa-smile na ako. Yun lang naman. But generally, the event itself was a success. I loved how the performances were artistically executed and the emcees, Teacher Lois and Teacher Merlie, sounded very articulate. That's a big deal ha. May naatenan akong school event ng nephew ko noon na yung isang teacher ang sabi sa honorable eh as if nagpronounce ng horse. Haha! Hangsarap hatakihin ng haltapresyon. Anyway, I think LB will stay longer in PSS. The school has tasteful choices naman kasi, to be fair. And they taught my daughter well. Disorganization might come from that little reason of having small number of teachers. But, the Moving-Up was not held in a basketball court or school gym, so it was well thought-of. Osha, opinions over. Photos naman. There, we invited my MIL, Mama A and my mom, Lola L but Lola L didn't make it because she was super busy daw. I hope you'll enjoy looking at the photos as much as I enjoyed taking them. Sorry for the blurry effect, the camera was nag-iinarte that day. It was really humid kaya I didn't like the look of my make-up. Basta, super Oily Mercado. Pero ayos lang, kasama ko naman si Rhambo. 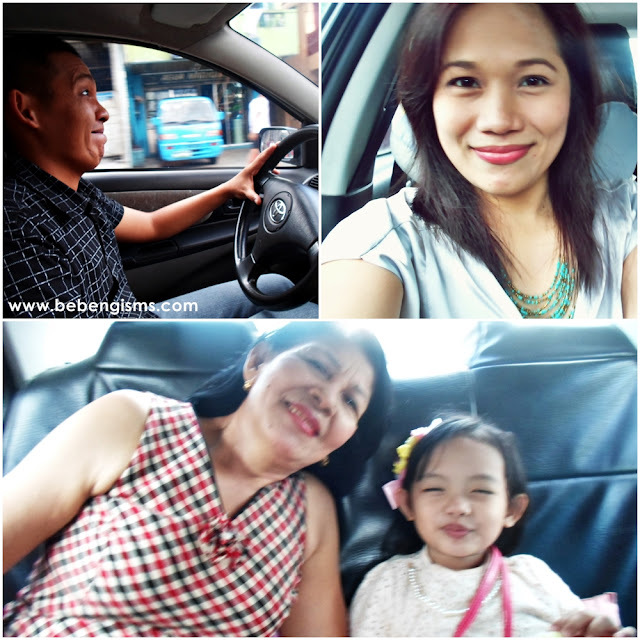 Basta driver, sweet lover. Like what I said, the students' performances were artistically executed. I'm so proud for the teachers who mentored the kids. As a MassComm graduate, I'm very pintasera when it comes to those things. Quese hodang bata ang nagpeperform, nalalait ko in my mind. But the PSS students won't allow me to do that. Ang galing nilang lahat and again, tasteful. Kaya paglabas ng cinema house, there was the amusement thingy there, we just let her. I planned to buy her anything Hello Kitty dun sa store on the 2nd floor kaso naglilikot lang. Hyperness siya after their performance. Parang bolang talbog ng talbog. Then we went to Casa Feliz for dinner. Again, on a separate post! It's a perfect opportunity to do another review of a Marikina restaurant. We got really full and tired that when we got home, we immediately cleaned up and went straight to bed. We tried out LB's new lamp that Mama A gave her as a moving-up gift. She said that LB requested for it talaga. It's red and beautiful. 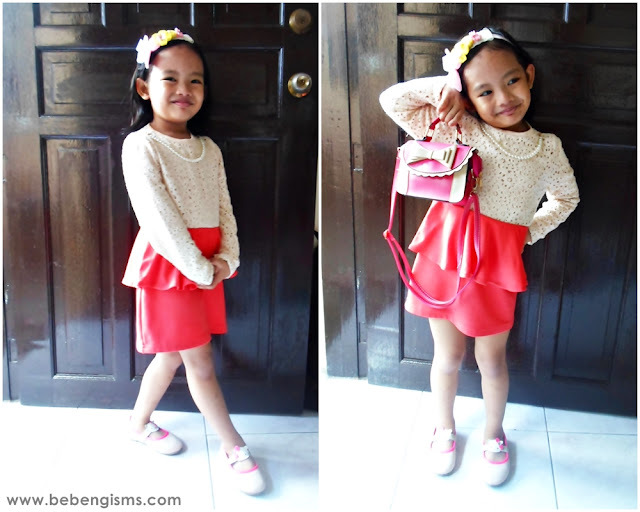 The little lady lang nago-operate, ayaw niyang pahawak sa amin. But we can't afford to get mad at her because she gave us so much joy and pride that day --- our Most Improved little achiever. Congratulations to LB for bagging that award! And oh by the way, I loveeee the hello kitty shoes. 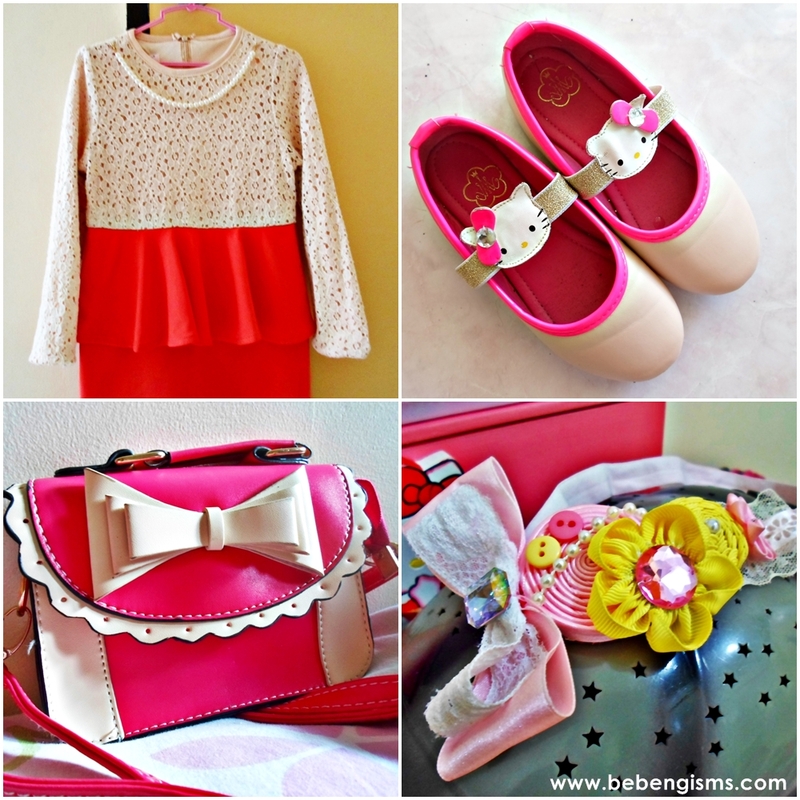 I can't wait to style my little girl with lots of hello kitty stuffs. Comedy ang honorable mhention na mharamhi hech! Lol.